If you are a proud owner of the new and long awaited Galaxy Note II you know looking for the perfect case for the device is not easy and are very limited. Today Samsung announced bundles of Protective Flip Covers for not only the Galaxy Note II but for the Galaxy S3 at a discounted price. Samsung’s unique Flip Cover design was introduced alongside the original Galaxy Note and again with the Samsung Galaxy S III. Now, just in time for holiday shopping, the launch of the Galaxy Note II on five major carriers brings this premium accessory to users in seven stylish color options – Titanium Gray, Marble White, Light Blue, Pink, Mint, Lime Green, and Orange. 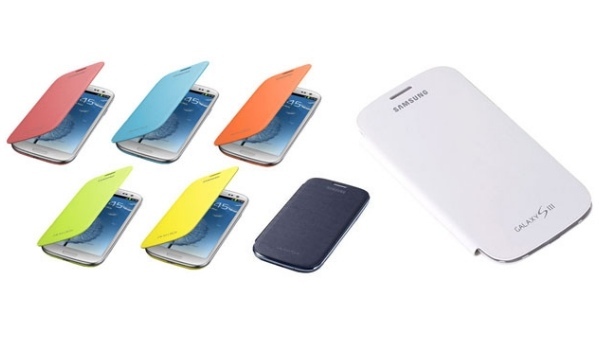 With the option to purchase a bundle of Flip Covers in a variety pack of colors, Galaxy Note II customers can change Flip Covers to match any occasion or outfit, just like jewelry, hats, and other fashion accessories. The Samsung Protective Flip Cover is a one-piece folding design with a stylish front cover and glossy snap-on back. While the front flap of the Flip Cover shields the 5.5-inch HD Super AMOLED touchscreen display of the Galaxy Note II from pesky fingerprints, scratches, and dirt, the back of the accessory snaps on to replace the phone’s back battery cover. This distinctive design provides additional protection to the screen while retaining the slim profile of the Galaxy Note II. The Protective Flip Cover also enhances the overall look and feel of the Galaxy Note II with a design that perfectly complements the smartphone’s narrow form factor. I own a white cover for the Galaxy Note II and a Light Blue for the Galaxy S 3 and the great thing about the case is, you can talk on the phone while the cover is over the screen which means if you where make-up you won’t have to worry about getting make-up on the screen.